Our distribution centers are conveniently located so we can deliver the freshest produce to customers across Virginia, Maryland, Washington DC and North Carolina. From national chains to the corner store, we provide the attention and service your business needs to succeed. 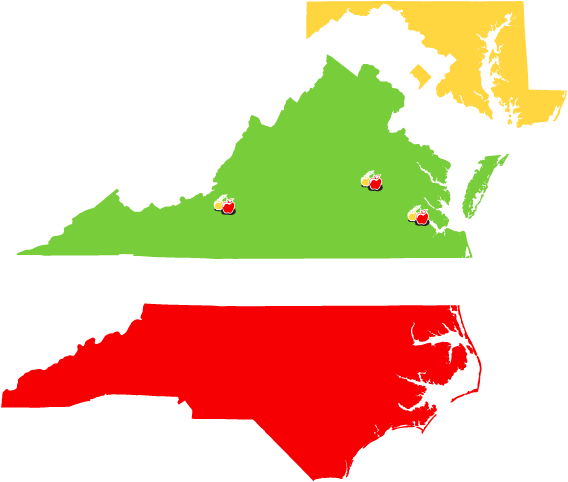 Our three distribution centers located in Ashland, Roanoke and Newport News Virginia to allow plenty of flexibility and maximum reach. We deliver fresh fruits and vegetables daily to more than 800 customers. Our clients span national restaurant chains, neighborhood pubs, grocery stores, the military, and more—we can develop specialized delivery plans to get you what you want, when you need it, whether it’s local or exotic.